There’s An Elephant in My Window. Three really. Two of them are African elephants I know, because they have big ears, and the third, with small ears, must be an Indian. I felt the first one watching me one morning while I was sitting in the spot where I meditate. Or try to meditate. I’m bad at being spiritual. If meditation is time when one should clear one’s mind of thought and become one with everything, well, I’m a complete failure, because during my ten minutes of quiet I think too much. I can hardly wait for the ten-minute timer to go off so I could write down some of my thoughts. I try not to think, but I do, and one morning while meditating, I was thinking about a lecture I had to give at the Museum of History in El Paso. That was when I saw him looking in the window at me. He looked like Horton, big floppy ears, wide innocent eyes, and a big, gentle smile. I tried not to think about him, because I was meditating, and I wanted to clear my mind, to release my spirit into the great nothingness. I was busy being spiritual! If I turned my head slightly or averted my gaze, he disappeared, but when I looked directly at him, he was there as clear as…well, as clear as an elephant in the room. Now, in the reality I share with most people, Horton was a pattern in the water stains inside the windows. They are double-pained, and throughout the years water has leaked in between the slats of glass, leaving white streaks and stains, and if you looked closely enough and with the right focus, you could see Horton. He’s shaped just like him, and if he were a religious icon instead of a cute cartoon, Catholics would be lining up outside my house. The next morning, before I tried to meditate, I closed the shades, and Horton disappeared. I was determined not to be distracted by him. I set the ten-minute timer, got into my kind-of lotus position, and started my meditation. I felt especially spiritual that morning, and I was ready to get a glimpse beyond the veil, to see reality without it’s façade, to look into the mind of God. At least that was what I was thinking while I was trying not to think. That’s when I saw the second elephant. This one wasn’t a cartoon, but a beautiful white elephant with perfectly proportional ears and a round head. She was elegant, like she stepped out of a Klimt painting. I don’t think she was even paying attention to me, but I couldn’t stop seeing her and I started to think too much about her. In what we call “reality, the second elephant was the shape of the windows with the white plantation shutters. The window is in four parts. The biggest window is the middle, with two thin windows the same height on either side of it, like elephant ears. On top is a half arch window, like the tip of the elephant’s head, and running down the middle of the blinds, the line suggests a trunk. I guess you have to use your imagination to see it, and that morning my imagination kept showing me the elephant. No matter how much I tried to forget her and to concentrate on not concentrating, trying to clear my mind, the damn elephant wouldn’t leave me alone. I mean, I know that everyone creates their own elephants. Whether we see a face in a rock formation or a discoloration on an old wall in the shape of a woman, we see things that we know are simply optical mistakes. We give pattern to chaos, meaning to things neutral in meaning. But MAYBE, I thought that morning, MAYBE this isn’t the way I should see those elephants. I mean, I saw two elephants on two consecutive mornings. Maybe when we make those optical mistakes, like my elephants in the windows or like when the poet Javier Huerta sees an old lady in a sweater draped across a chair, maybe it’s our imaginations communicating something to us. When you’re walking on an open road and you see a tree branch blur in your periphery and at first you think it’s a monster, maybe there’s hidden reasons why you see a monster, and not, for example, a friendly giant. Maybe when we’re on a rural highway and we see a dead cow in the distance in the middle of the road and as we get nearer, we see it’s only a pile of leaves, maybe there’s a reason we see a dead cow. Our imaginations, without the limitation of ‘reality’, may be showing us an alternate reality, one that may equal ours. Why did I see Horton in the water stains in the window? Why not a mountain range? Why not la Virgencita or Christ on the cross? Why not Buddha, or a donkey, or a VW Bug? Why not a map of some country I long to visit? Ever since I was a kid I loved elephants. I might have been a skinny kid who moved around like lightning, but inside I was an elephant. I was huge. I was fat and slow. My brother knew how fat I thought I was, and he used to call me “fat boy,” and it hurt my feelings, so naturally he kept calling me that. Fast forward some decades later. Do you remember that literary moment when Cortázar’s protagonist is at a Paris zoo looking at the Axolotl, and at the end of the story he becomes the Axolotl? The man stares at the fish and the fish stares at the man and they see each other and they become each other. A similar thing happened to Borges when he was a child visiting the Buenos Aires zoo, only it was a tiger. That was the animal he identified with and out of whose eyes he wanted to see. Borges became the tiger. Anyway, one day when I was depressed because my first novel wasn’t selling as many copies, I went to the zoo. I was in Buenos Aires, because, having had no experience how to sell a book once it’s published, I took my advance money and decided to live in Argentina for a year. Really, I cannot emphasize enough what a stupid mistake I made in leaving the country when my book came out, not being there to do readings and interviews, to promote my work. There was nobody back home to sell it, and even though the novel came out with a trade press, they will only do so much. 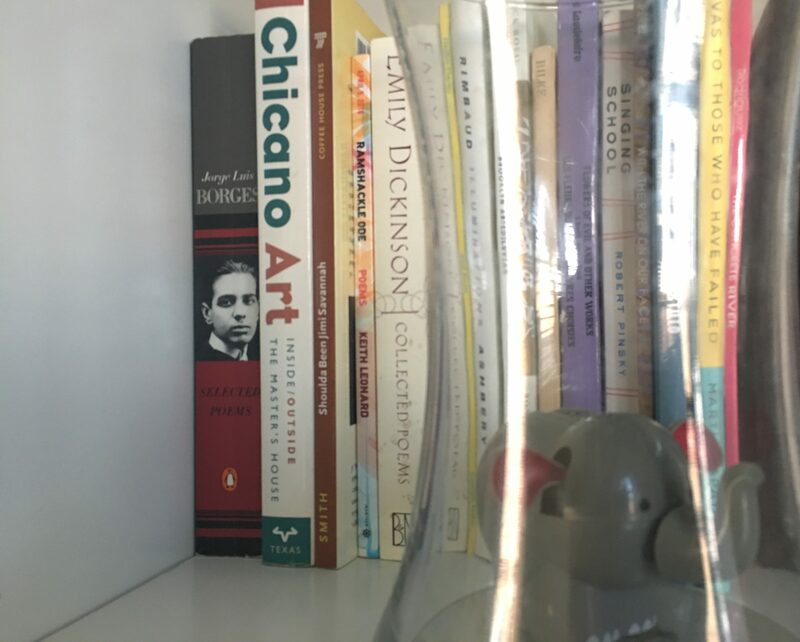 It’s up to the writer to sell his or her book, but there I was at the zoo in the heart of Palermo, six thousand miles away from where my novel was collecting dust on the shelves of Barnes and Noble, and I remember staring at the elephant and the elephant staring back at me. In fact, the elephant walked closer to me, which made me think he saw something in me. He walked as close as he could and stuck out his trunk to me, like a hand offering help. Later, I learned that at the Buenos Aires Zoo you could feed the elephants, so now I know it just wanted food from me, but at the time, as I watched him watch me, as I beheld him beholding me, as I looked into his wide, wanting elephant eyes, I begin to imagine myself from his point of view. I imagined I was him looking at me. I saw myself standing with two legs. Elephants are part of my metaphorical identity, and that’s why I saw elephants in the window on two consecutive mornings. Like most sane people, I know the experience was simply the human tendency to create patterns. It’s just how the brain works. Nothing “other worldly” about it. But then I saw the third elephant! On the third morning, as I was preparing to meditate, I decided to leave the blinds half open, that way I couldn’t see Horton or the Klimt elephant. And that’s when I noticed, sitting near the window, an elephant tiny enough to fit into the palm of my hand. It was made of plastic, one of those solar dancing toys, his ears flapping, his tail wagging according to the sunlight coming in from the window. Jolene had bought it for me a few months earlier, and she had placed it right by my window in my office. I forgot it was there and hadn’t noticed it in a while, because it was behind a stack of books. But there it was, the third elephant, it’s ears flapping up and down. I understand that on one level my neural network was firing up multiple elephant sightings, because of my memory with elephants and the meaning to which I ascribed to them, but maybe there’s other levels of reality worth considering. Maybe God was trying to tell me something. Maybe the Universe (optionally insert ‘God’ here) finds ways to use phenomenon to communicate with us, not direct messages with syntactical clarity that tell us what to do, but in what we observe, like a persistent flower pushing through the cement in a city sidewalk. We cannot help but think, I need to be like that flower! Elephants are emotional, loyal, intelligent. They are loyal to their families. To other elephants in the herd. Maybe God/my brain/the universe was telling me (although not syntactically like this, “Chacón, I am giving you a gift of your family and friends”) . . .maybe I was being told to be like an elephant. At least that’s what I was thinking during my morning meditation when I was trying not to think.